The Russian Defense Ministry has commented on the situation in Syria's areas, controlled by the allies of the US-led coalition, after a senior American general accused Moscow of acting as "both arsonist and firefighter" in the Arab Republic. Syrian civilians experience the most suffering in the areas controlled by the US-led international coalition and the armed opposition groups Washington is backing, Russian Defense Ministry spokesman Maj. Gen. Igor Konashenkov said Wednesday. "At the moment, the most difficult circumstances for the civilian population of Syria exist in the areas controlled by the US-led coalition and the groups of the armed opposition it is controlling," Konashenkov said. According to the spokesman, the situation in these areas was not transparent to Damascus or to the international observers, despite the declared victory over Daesh terrorist group. Konashenkov pointed at the difficulty of the situation in the vicinity of Rukban refugee camp in At-Tanf region and stressed that the inhabitants of the camp could be helped by humanitarian convoys and evacuation for medical treatment. 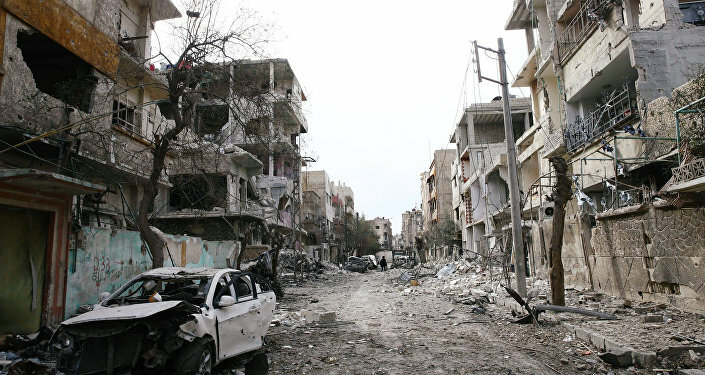 The spokesman of the Russian Defense Ministry added that the civilians in Raqqa were experiencing a "humanitarian catastrophe" and the city infrastructure was in dire need of restoration. Konashenkov added that the humanitarian disasters in Raqqa and At-Tanf had to be addressed by the international aid organizations as soon as possible. The statement followed a remark made by the head of the CENTCOM, US Army General Joseph Votel, who blamed Russia for allegedly playing a destabilizing role in Syria: "Diplomatically and militarily, Moscow plays both arsonist and firefighter, fueling tensions among all parties in Syria… then serving as an arbitrator, to resolve disputes, attempting to undermine and weaken each party's bargaining positions." "I think either Russia has to admit that it is not capable, or it doesn't want to play a role in ending the Syrian conflict. I think their role is incredibly destabilizing at this point," Votel claimed. Commenting on the halt of fighting in Syria on February 27, State Department spokeswoman Heather Nauert said that Russia was failing to abide by the ceasefire. "They're not adhering to the ceasefire because they continue to sponsor and back Bashar al-Assad's government. That is tragic," Nauert said. Earlier this week, following the adoption of the UNSC resolution on a 30-day ceasefire in Syria, Russian Defense Minister Sergei Shoigu announced that Moscow had proposed creating a commission under the auspices of the UN to assess the humanitarian situation in the Syrian city of Raqqa. "That is why we propose to create as quickly as possible on the basis of the United Nations and under its leadership, an international assessment humanitarian commission that could look at and assess what is really happening in Raqqa where, unfortunately, no one is allowed to — neither the media, nor humanitarian organizations," Sergei Shoigu said at a meeting of the board of the Russian Defense Ministry. This move came shortly after Shoigu announced a daily humanitarian pause in Eastern Ghouta as well as the establishment of a humanitarian corridor to evacuate civilians safely. Moscow has made it clear that its intentions to restore peace in the country as well as to avoid any casualties among civilians are serious. Besides proposing to open humanitarian corridors in Eastern Ghouta, Russia has also suggested that the same is done in At-Tanf, where the Rubkan refugee camp is located. However, the proposal was rejected by the US. "We propose to establish similar humanitarian corridors, humanitarian pauses in the At-Tanf and Rukban, so that the civilians can freely return to their homes and begin to restore peaceful life," Shoigu said. The accusations come amid a Russia-brokered ceasefire in Syria, which has been violated by militants backed by the US. According to the Russian Defense Ministry, after shelling exists from Eastern Ghouta, preventing civilians from leaving, the militants started a new offensive against the Syrian government troops. The humanitarian pause in Eastern Ghouta comes in line with the UN Security Council's Saturday resolution 2401, calling on all parties to the conflict to promptly stop all clashes and adhere to a long-term humanitarian pause across the whole territory of Syria in order to guarantee the safe and unhindered supply of humanitarian aid as well as the medical evacuation of those injured.